A major distinguishing feature of Buddhism compared to other religions is that the story of the worshiped one is that of a normal human. One not gifted in any particular way or blessed by any God – just of one who tried his hardest to attain the truth. Buddha is the retelling of this story. And while the main themes of the story are extremely well-known, I haven’t come across as intimate or as beautiful an account of the Buddha’s life as this one. While I’m sure some of the events portrayed were invented by the author, the main story sticks very closely to the actual story as told by the Buddhists. Deepak Chopra does an admirable job of keeping the story clear and simple. While I find his non-fiction books very well-written, the only other piece of fiction I’ve read by him (The Return of Merlin) was a bit too complex for my liking. 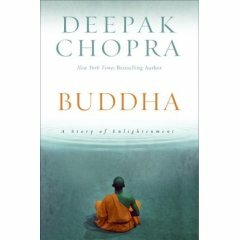 For the most part, the book focuses on the struggles that the Buddha goes through while trying to attain enlightenment. Often the observations and anecdotes that are told are profound to the degree that they are nearly Zen Koans. In short, it’s a wonderful book for anyone interested in spirituality or Buddhism, and I thoroughly enjoyed reading it. PS: I realize I’ve not been posting much lately. The blog’s way of saying that you aren’t blogging enough is requiring you to retype your password! Hopefully, I won’t away for too long again. This was written by Anshul. Posted on Friday, June 1, 2007, at 1:33 am. Filed under books, philosophy, reviews. Bookmark the permalink. Follow comments here with the RSS feed. Post a comment or leave a trackback.